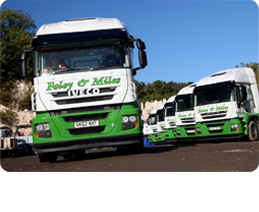 Established in 1993, Foley and Miles have a reputation for providing an efficient and reliable service with outstanding customer care. Historically our specialist service has been providing brick and block haulage solutions within London and the Home Counties. 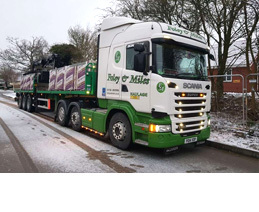 With over 60 vehicles on our fleet, ranging from Rigids, Drawbars and Artics, we are also geared up to service our customer requirements up and down the UK. We operate from two main depots, our head office in Thurrock Essex, and Borough Green, Kent. Recently we have invested heavily in our fleet making us one of the top hauliers in our area with many specialised hiab crane vehicles to ensure safe loading and unloading of various types of materials. We can deliver 24 hours a day, 7 days a week. We are able to be very flexible in the day to day delivery requirements and understand that they can fluctuate on a daily basis and sometimes on an hourly basis. Our experience is put to use when there is access problems, difficult or awkward loads. We always enjoy the challenge of being able to solve your problems quickly and efficiently. It’s what our reputation has been built on! Our fleet of modern vehicles are all London Emission Zone (LEZ) compliant, equipped with satellite navigation and modern communication systems to ensure maximum efficiency. Our vehicles and drivers are Crossrail compliant, we are also Bronze members of the Freight Operators Recognition Scheme (FORS) and we have recently gained our ISO 9001 along with the Achilles Accreditation. This is where we started. Delivering bricks and blocks for manufacturers, merchants and end users, we cut our teeth in this most demanding environment. 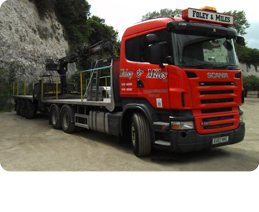 We are able to keep builders happy by providing a reliable service, which means they can organise tradesmen with confidence, knowing Foley and Miles will deliver wherever and whenever possible. There is a huge demand for loose bulk loads. We have a fleet of bulk tippers that can haul any granular material from ash to aggregate, sand to shale. We appreciate that loads can be needed at very short notice. Our fleet of bulk tippers offer a fantastic and reliable service should your requirement come with a long term or short notice period. We have a fleet of flat trailers to carry palletised loads small plant and railway related products. We can also offer a traction only service. We can offer you the best way to get your load delivered in the most cost effective and time efficient way. If you have questions regarding, access, weights or general delivery issues, call a member of our transport team for help and advice. We also provide a specialist service for bespoke load or transport requirements that are not a standard haulage type. Please click here for more information.